Our Year at a Glance. I would like to wish all my new blogger friends a very Happy, Healthy, Prosperous and Peaceful New Year. We wish you a Merry Christmas...............Carolers. The days are flying by and like me I guess you are all short of time and it's a bit of a hassle trying to get everything done? On top of that yesterday I was feeling a little under the weather and so missed Mosaic Monday at Mary's for the first time in I don't know how long. 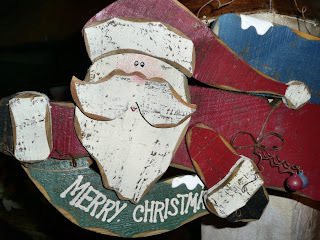 So, today I'm joining Tam @The Gypsy's Corner for 3 or More Tuesday and popping in on Susan's Deck the Halls meme @ Thoughts From Over The Rainbow. 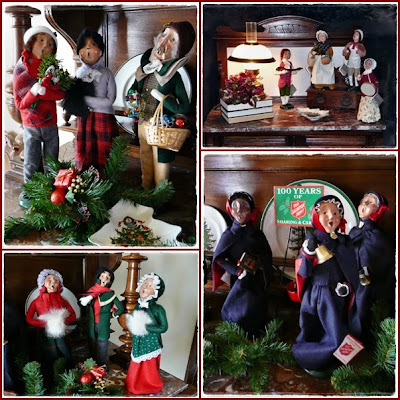 I started collecting Byers Choice Carolers many years ago after admiring them in the home of an American friend who I met whilst living in Bavaria, Germany. 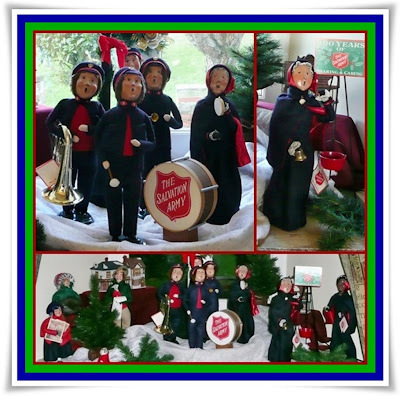 I began by assembling my Salvation Army Band which I discovered in a beautiful Christmas shop in Windsor, Berkshire. 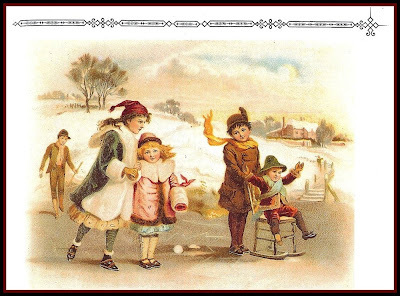 Then whenever I came across the Carolers, whilst on vacation in the States, I would always buy "a couple" from the Victorian shoppers range. 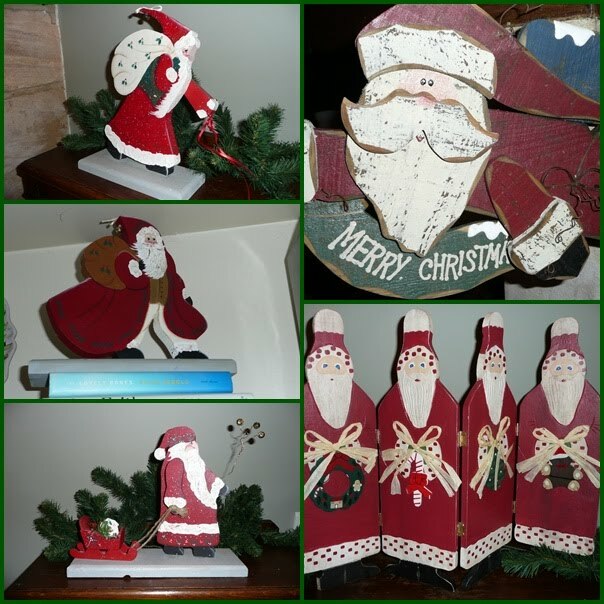 Family and friends soon caught on and before long I was receiving Carolers as Christmas gifts,. 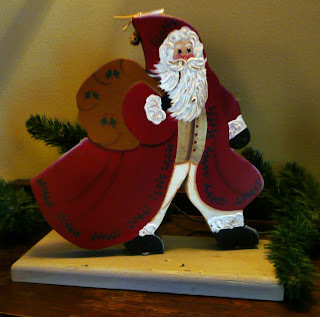 One year I received the flickering lamp post, under which the Salvation Army gathers every year. 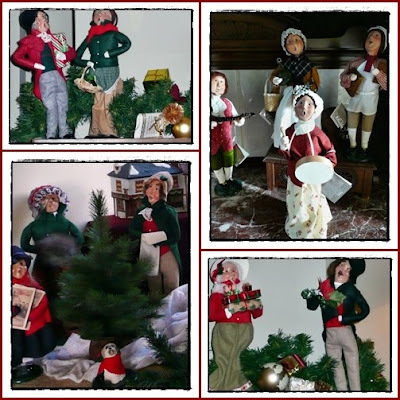 On a trip to Colonial Williamsburg I found the Carolers which represent colonial times and so began another collection. Tavern keeper, his wench (!) and a pair of travelling musicians, where will it all end? Labels: 3 or more Tuesday, Byers Choice Carolers, Deck The Halls. Our front doors on Monday evening. 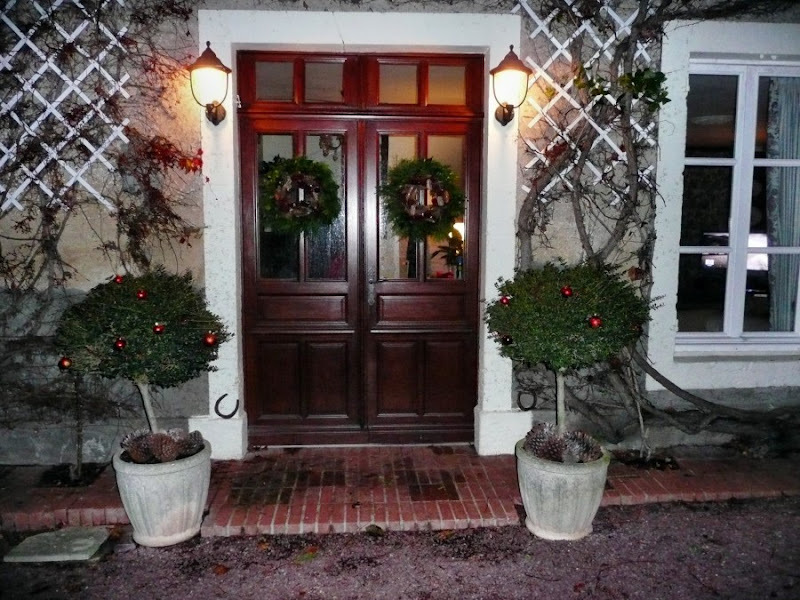 Our front doors on Friday evening. We may well have a white Christmas after all. 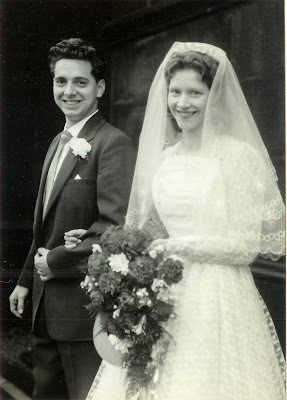 I can't remember if the snow held off or not but 50 years ago today it was a very cold Saturday in Lancashire, England when June married Roy at St Mary's Parish Church in Oldham. The Bride and Groom, Mr & Mrs Roy Bland. The parish church was built in 1830 (but on all accounts this was a replacement for a former church which stood on the same site) and its interior was painstakingly restored to its original unusual design in 1974. In 1827, Sir Charles Barry’s plans were rejected for the rebuilding of Oldham Parish Church. Barry eventually built the houses of Parliament. I wonder what these plans looked like, and what Oldham missed?! 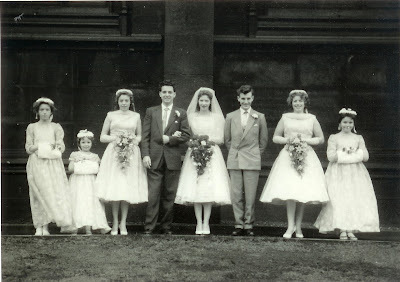 Congratulations Aunty June & Uncle Roy on your Golden Wedding Anniversary from Margaret your 9 year old Bridesmaid. 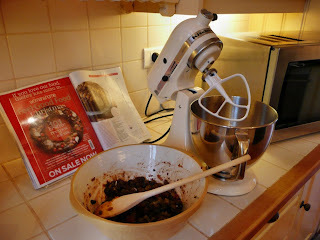 Christmas Cakes and Foodie Friday. 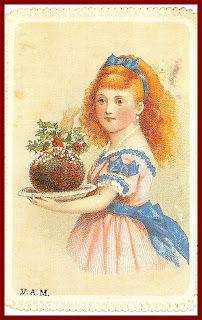 Traditionally Christmas cakes in England are made in early October and fed weekly with brandy maturing nicely until two weeks before the big day when the marzipan & icing go on. 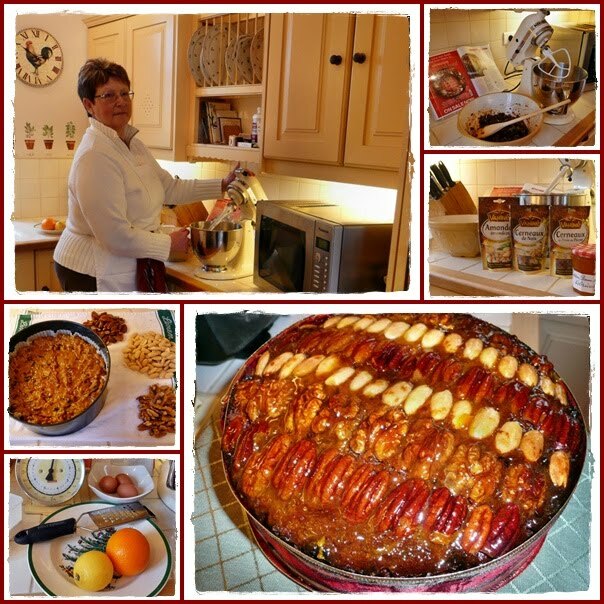 For many years my MIL enjoyed baking a Christmas cake as a special gift for us and, as tradition had it, would always cover the basic fruit cake with a thick layer of marzipan and then royal icing on top of that. 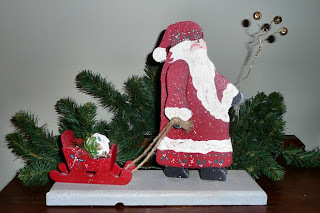 A small christmas tree, children playing, silver balls and all kinds of other cake decorations would cover the surface and a wide red ribbon was fixed in place around it. 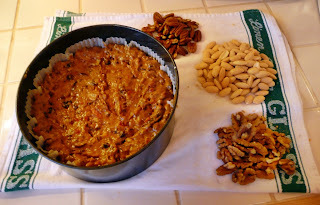 DH & I hate marzipan and icing but never wanted to hurt her feelings and I don't think she ever knew, that we would remove every last bit before savouring the rich fruit cake beneath. 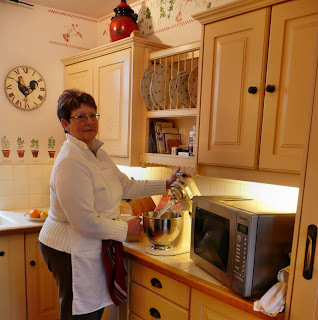 Readers of my blog will know that I was enjoying myself at our HHI home away from home in October which means that I was quite late with baking my cake this year. Delia (Smith) to the rescue. The December issue of my Woman & Home magazine was delivered early November and included recipes taken from Delia's new book "Delia's Happy Christmas". Lo & behold! 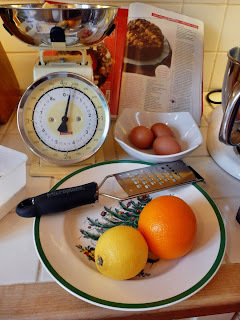 "The Last Minute Brandied Christmas Cake". 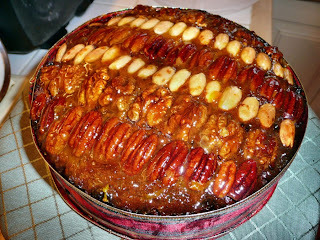 Funny thing is at Delia online the recipe is called Last Minute Sherry Mincemeat Cakebut whatever your choice of tipple this is a such an easy recipe to follow and produces an amazing looking cake. After the festivities are over I'll report back if it tasted as good as it looks. 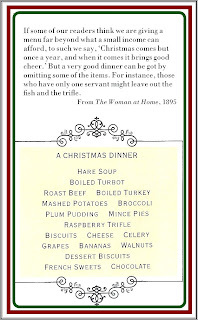 In the late 1800's Woman & Home magazine was titled Woman at Home, here is their menu for Christmas Day and two more Victorian illustrations from my V&A Christmas List Book. I'm joining Michael Lee @Designs by Gollum for Foodie Friday this week and am so looking forward to seeing all the amazing festive recipes and picking up some new ideas. 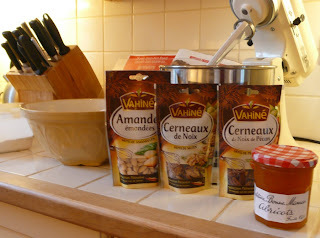 Her blog already has so many wonderful treats to share, care to join us? Baby, it's cold out there. 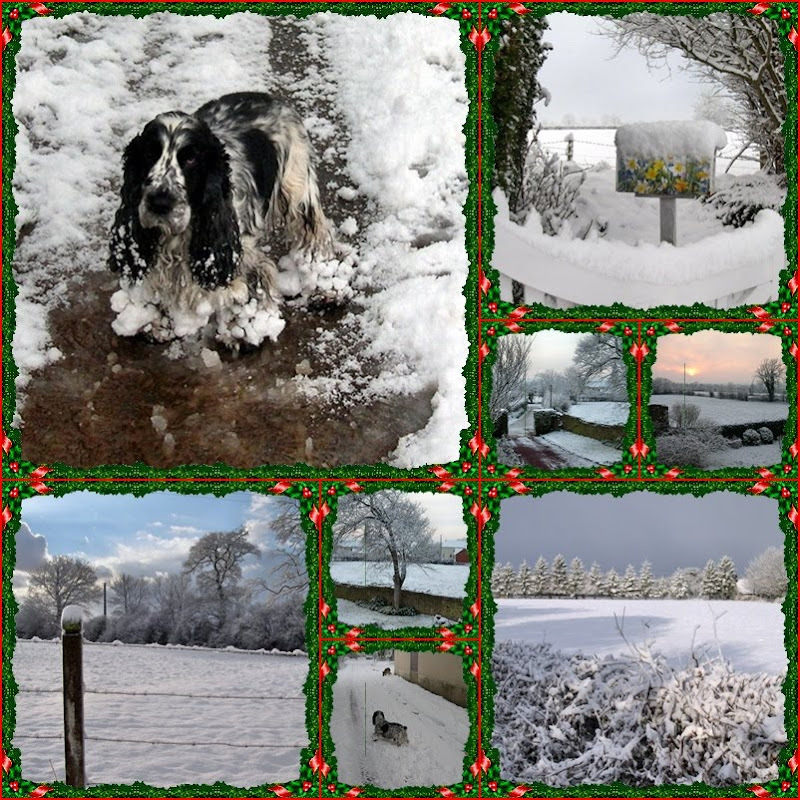 For Outdoor Wednesday today, graciously hosted as always by Susan @ A Southern Daydreamer, a snowy landscape mosaic featuring Mr Ben the Snowman and another of my white Christmas tree. The snow mosaic photo's were taken in 2004 and 2005 when we had snow for Christmas and in the New Year. I don't think we'll be having a white Christmas this year, although a glimpse out of the bedroom window early this morning revealed fields covered in a very thick frost. 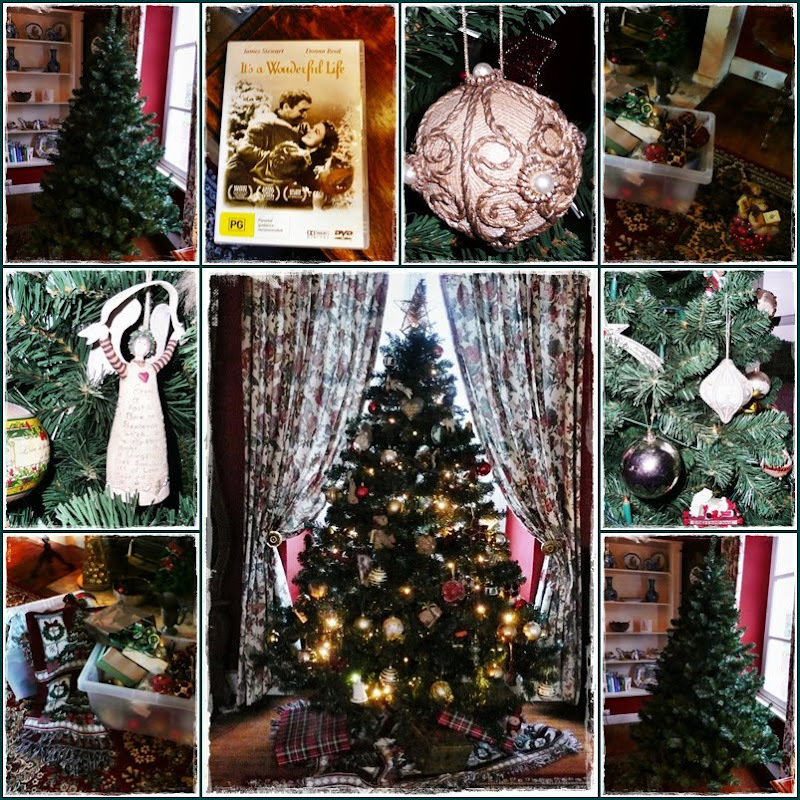 On Monday I showed you the tree in our library, which I enjoyed decorating very much, the next day I couldn't wait to try out my ideas for the smaller tree in the sitting room. I decided on a white with silver accents theme and used large white silk poinsettias, white and silver baubles, clear glass stars, silver gift boxes, stars and beads. Pride of place went to the white heart with pearl accents that Joyce (stepmum) gave us for our 30th Wedding Anniversary. Mr Ben, who is never far away from me, sat patiently nearby ready to give his opinion on the finished ensemble. 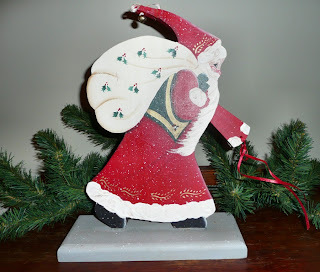 Jackie @ Jackie's Personal Blog took up my book recommendation recently and has just finished "A Redbird Christmas". She blogged about it here. I wonder if anyone else did? I would love to know what you thought of it, if you did. Welcome to our home all dressed up for Christmas. 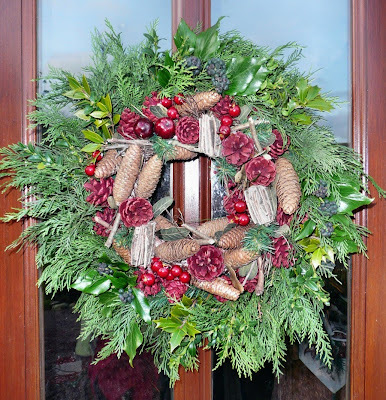 Today I am participating in Karen's "Doors of Welcome" meme which is taking place at "Some Days Are Diamonds", and also Susan's "Deck The Halls" at "Thoughts From Over The Rainbow". When you've checked out my contribution please do go and visit them both for even more festive cheer and see all the wonderful Doors & Halls gathered together today. 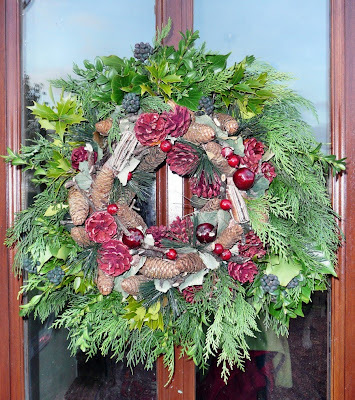 Fresh wreaths are very scarce in Normandy and so this year, as usual, I took a pair of "couronne artificiel" and enhanced them with fir, holly, ivy (rich with dark blue/black berries) and box from the garden. 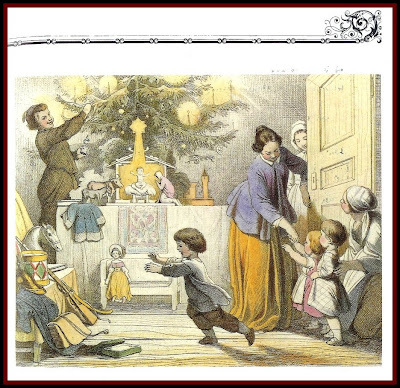 A Victorian Christmas as described by Charles Dickens in the short story A Christmas Tree. 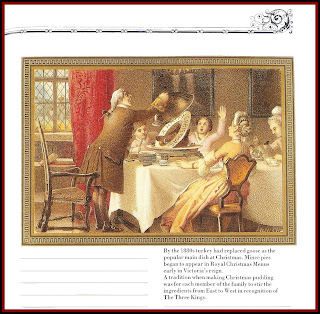 A pretty Victorian festive scene, from my Victoria & Albert Christmas List book. The hearth beneath the mantlepiece . The library tree from outside looking in. Labels: Charles Dickens, Christmas tree, Deck the Halls, Doors of welcome, Victoria and Albert. Oh! Christmas Tree, oh! Christmas Tree. 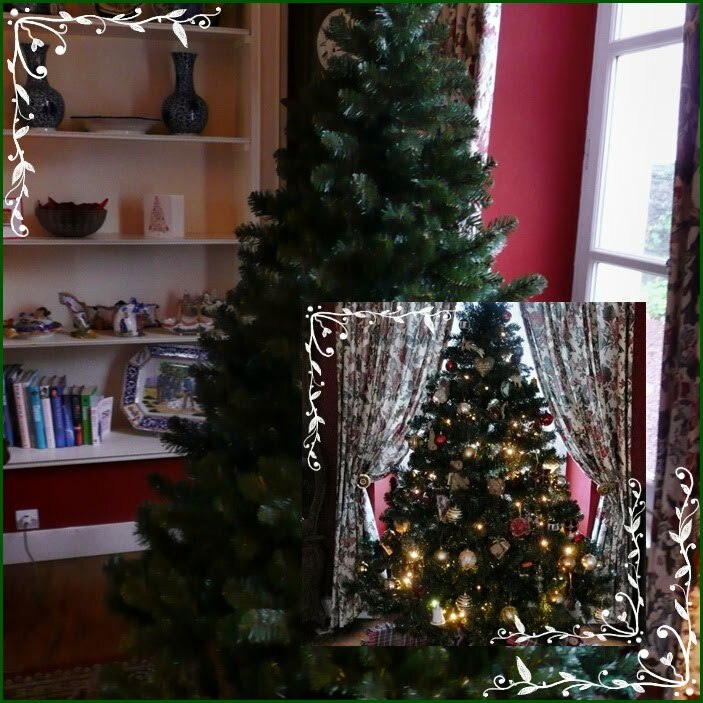 The last but one Monday before the holidays begin means I'm sharing my tree mosaics with everyone participating in Mosaic Monday over at Mary's little red house. I'm always amazed at the marvellous diversity of mosaics which one can see there, so do give yourself a treat and visit Mary today. It might be the busiest time of the year but one seasonal ritual cannot be forgone and that is decorating the Christmas Tree. 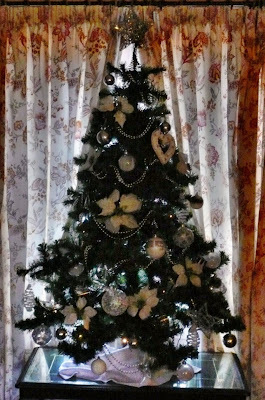 We always have two trees, one in the sitting room and a larger one in the library. For many years I withstood the cajoling from my DH to have "fake" trees but finally surrended gracefully one or two years back, and have to say I haven't regretted the decision. So much less mess in January. One afternoon last week I assembled my boxes in the library, popped A Wonderful Life into the DVD player, brewed a pot of tea and submerged myself in the joy of it all. 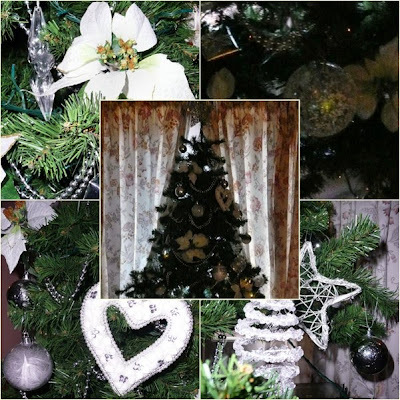 I'll show you the silver and white decorated, sitting room, tree on Wednesday. 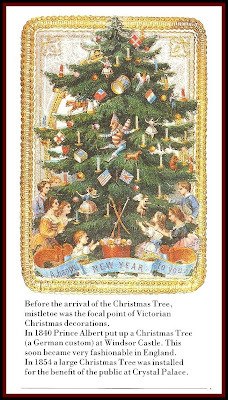 In 1840 Prince Albert put up a Christmas tree (a German custom) at Windsor Castle. This soon became very fashionable in England. Oh! Christmas Tree click here for words and music. "If you wish to make the holly look snow-laden, moisten it with weak gum, or starch water, and then sprinkle with flour from a dredger"
How to Decorate the House at Christmas Time, from (Victorian) Cassell's Family Magazine. 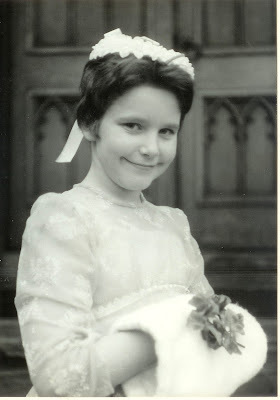 Before you go .......................I want to tell you about one of my favourite blogs, Jane's "Blondie's Journals". 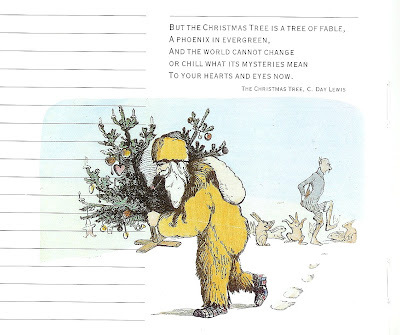 For a wonderful Christmas Tree tale click here, it's magic! 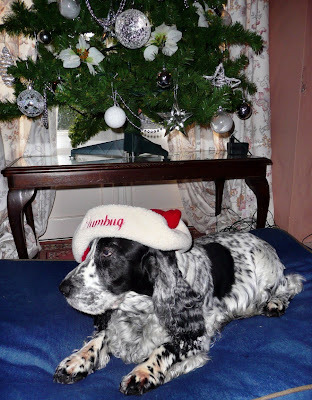 Even Scrooge wouldn't say "Humbug". 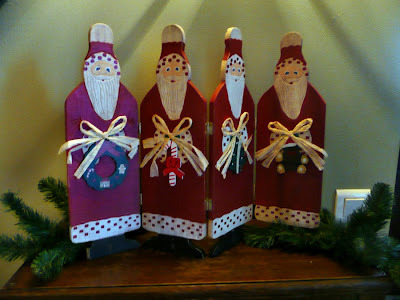 Carrying on the Santa theme with some handcrafted wooden Santas from my collect ion, I'm participating in Mary's Ruby Tuesday party at The Work Of The Poet. 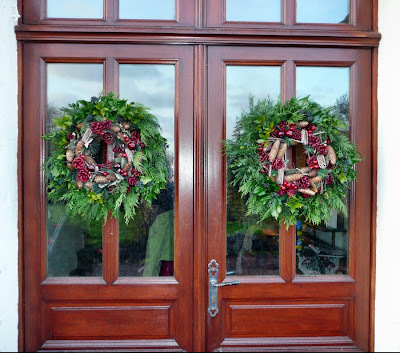 Mary has a great post today you just have to go over there and see what she & her husband have done to their front door! 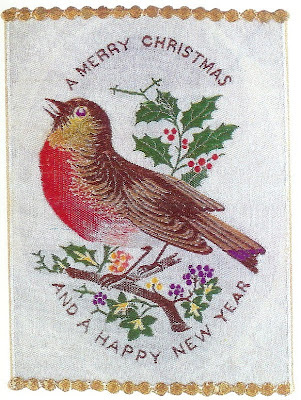 and from the Christmas List Book two vintage cards the robin and Sankt Nikolaus wearing yellow?